The heads of Iran and Russia’s state-run nuclear agencies discussed the construction of new nuclear plants in Iran during a meeting held on Friday around the same time that Iranian President Hassan Rouhani and his Russian counterpart, Vladimir Putin, also sat down for a chat about Tehran’s ongoing nuclear negotiations with the West, according to regional reports. Behrouz Kamalvanda, a top official at Iran’s Atomic Energy Organization (AEOI) met early Friday with Sergey Kirivenko, the director general of Russia’s state-run nuclear company, Rosatom, to discuss way the two nations can "boost nuclear cooperation," according to Iran’s state run news agencies. The two nuclear officials—who were accompanied by other senior Iranian and Russian officials—explored ways for Russia to assist Iran with the construction of new nuclear plants, according to the Islamic Republic News Agency (IRNA). The high-level meetings come as both Iran and Russia move further away from the U.S. and other Western allies. In addition to the meetings between the nuclear heads, Rouhani and Putin held meetings with one other, as did the Russian and Iranian foreign ministers. Iran has expressed "frustration" and antipathy towards the ongoing negations with the West over its contested nuclear program, while Russia has successfully tested nuclear weapons as a show of force in the face of increased U.S. sanctions. Russia has long assisted Iran with its nuclear program and helped it construct the Bushehr nuclear plant, which emerged as a concern to Western officials who suspect that Tehran will use it to produce plutonium for a nuclear bomb. Russia’s Kirvenko is reported to have "hailed high level of ties between Tehran and Moscow" during Friday’s powwow, which took place in Russia. Putin and Rouhani also sat down together on Friday on the sidelines of an economic conference behind held in Tajikistan. 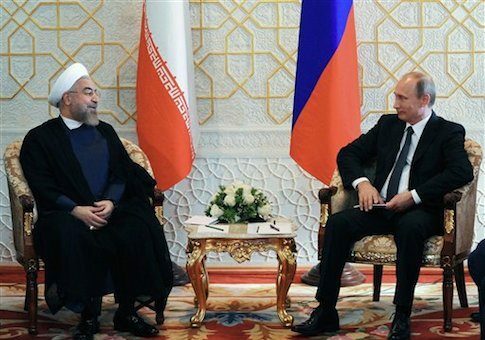 The leaders "called for called for further promotion of relations between the two countries," with Putin putting particular emphasis on expanding cooperation in the "energy sector," according to IRNA. Rouhani in particular asked for greater Russian assistance in the "technical and engineering exchange," according to the report. Putin went on to announce that he will form a special committee in Moscow to handle relations with Iran and enact various agreements the two countries have struck, potentially including ones to ship Iran advanced weapons. Iran’s nuclear pursuits also were addressed during a meeting between Russian Foreign Minister Sergei Lavrov and Javad Zaraf, his Iranian counterpart. Meanwhile, U.S. and Russian officials met Thursday to discuss Moscow’s violations of the Intermediate Range Nuclear Forces Treaty (INF). The U.S. announced following the meeting that its "concerns were not assuaged" in the round of talks. President Barack Obama simultaneously announced on Thursday that he and the U.S.’s European partners would "deepen and broaden sanctions in Russia’s financial, energy, and defense sectors," according to the White House. "These measures will increase Russia’s political isolation as well as the economic costs to Russia, especially in areas of importance to President Putin and those close to him," Obama said in a statement. This entry was posted in National Security and tagged Hassan Rouhani, Iran, Nuclear Energy, Nuclear Weapons, Russia, Vladimir Putin. Bookmark the permalink.